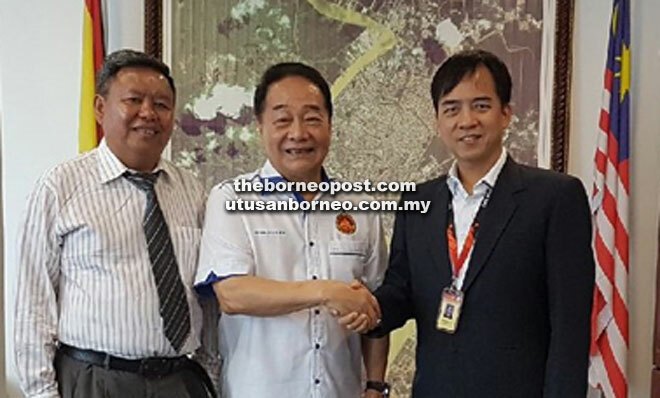 Wong (centre) bids farewell to Hii (right), who is promoted to the post of permanent secretary to Ministry of Tourism, Arts, Culture, Youth and Sports. Looking on is Siaw. SIBU: Former Industry and Investment Promotion Division head of the Ministry of Industrial and Entrepreneur Development, Charles Siaw, is replacing Hii Chang Kee as Sibu Resident. Hii has been promoted to the post of permanent secretary to Ministry of Tourism, Arts, Culture, Youth and Sports, effective this month. Hii is handing over the duties to Siaw today at Sibu Resident’s Office. Yesterday, Second Finance Minister and Minister of International Trade and E-Commerce Dato Sri Wong Soon Koh bade Hii farewell and welcomed Siaw. “I went to bid farewell to Mr Hii Chang Kee and welcome the new Resident (Siaw). I am happy for him (Hii) for his promotion. He deserves it because he has a record of prudent competence in getting things done. “During his tenure as Sibu Resident, Hii has shown excellent leadership and great ability in handling all sorts of programmes, functions and activities. “During his tenure, there were some very big programmes and activities such as big celebrations and so on,” Wong said. Wong also expressed his confidence that Siaw, being an experienced senior civil servant, would also do the job well. According to him, Siaw has worked in Welfare Department (JKM), Land Custody and Development Authority (LCDA) and also Ministry of Industrial and Entrepreneur Development. “I think for the past three years, he (Siaw) had been with the Ministry of Industrial and Entrepreneur Development. “I know him and I have confidence that he will also do a great job. “I appeal to Sibu community to work closely with the new Resident as they had done so with Hii Chang Kee,” Wong said. Prior to his appointment as Sibu Resident, Hii served as Sibu Municipal Council (SMC) secretary.